← Kids Yoga – Savasana: Even the Instructor Gets to Relax! Fall has arrived in the area where I live, bringing storms, wind and lots of rain! 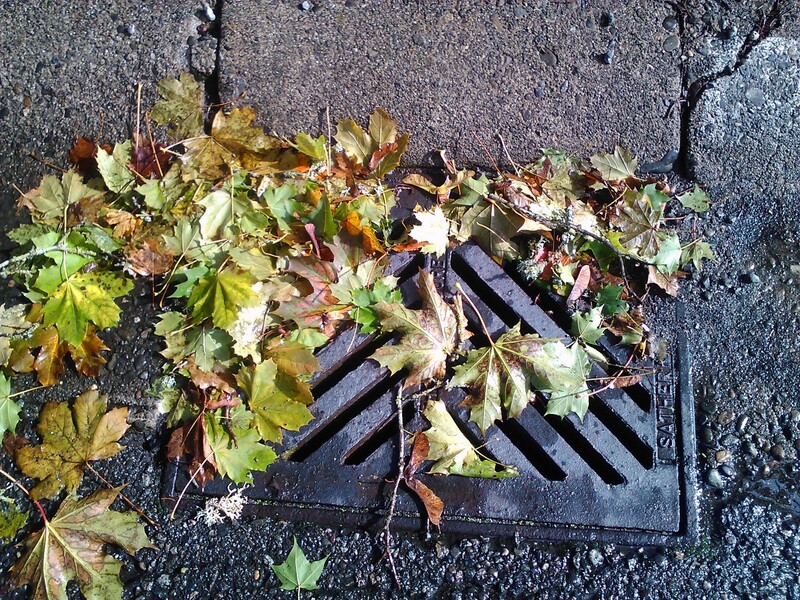 As so many leaves start to change colors and eventually fall from trees, I found myself this morning brushing drains on the streets in my neighborhood as I walked my dog. It all started involuntarily when I noticed leaves and branches piled up on top of one drain, as I stopped for my dog to check out yet one more tree. I can’t imagine leaving that drain all clogged and think of all the rain we’ve had on the past week and how the city could benefit from that. I am not looking for approval with this post or nice compliments. I did it because I felt it was the right thing to do. Can you imagine if all citizens thought like that? Our world would be cleaner, taking one less thing from what our environment already has to face with the consequences brought by civilization. I do not remember ever being taught this. Thankfully nowadays this subject is somewhat presented in schools and we have more environmentally conscientious kids being raised. As I have mentioned before somewhere in this blog, I was born in Brazil, in a city considered one of the most advanced among other Brazilian cities, where many kids are out of school, mostly because of their financial situation. Even if the government provides schools, many parents will not choose to send them, having other priorities in life. I will leave the explanation as it is; no need to get into it deeper right now, because my purpose with this post is to try to spread awareness to other parents and their kids about our environment, and how we can learn to care for it, as our planet is also a living being. Having moved to the US more than a decade ago, I can see a much bigger awareness about keeping our environment clean. Nonetheless, I squeeze some notions about recycling and caring for our planet in my kids yoga classes here and there, just to make sure “seeds are planted and being watered” as I like to say. I guess by being raised in the US, my kids have this awareness in them already. But, as a mother, I will keep bringing it up whenever a fun opportunity presents itself. For instance, I grew up in Rio, an area with so many beautiful beaches! It would break my heart to see that nice white sand full of dirt, such as plastic bags, straws, flip flops, etc. As my grandfather acquired a beach house and I would go often to the beach after I turned 14, I got into the habit of bringing a big plastic bag with me to the beach for all the trash I would collect there. On days when the temperature was not too hot, I would spend 2-3hours collecting trash. I didn’t even have to worry about looking like a weirdo at the beach, since it is a deserted one. It is not very close to the city, kind of in a secluded area. But trash comes from other places, even far distant areas, brought by the water and wind. I remember when my older daughter was about 10 or so and we had gone to Rio to visit family and friends. One day at the beach, she wanted to walk with me along the shore, which I gladly agreed to. Involuntarily, I started to bend over as we walked and picked up the trash, without even realizing it. All of a sudden, I noticed she was doing it, too! I t ook out plastic bags so we could collect even more and knowing she is a very competitive person, I asked her, “Want to see who fills up the bag faster?” She went for it. She probably won, but of course I don’t even mind or remember; that was not the point at all. I was glad she felt inclined to do it, too. This is just an example of how you can involve your child in some conscientious task, using your child’s qualities (strengths, weaknesses, points of view) to bring even more motivation into it! Some other people, even not-so-close-family members, who were also at the beach, did look at us puzzled as in why we would do that. Even though I did not get them to join us (yet), maybe by seeing us working towards the benefit of all a small window will start to open in their minds. And I hope someday most beachgoers will decide to bring a plastic bag to the beach to collect at least their own trash! As a multi-cultured family, it is our wish to bring good habits from one place to another, for the benefit of our bigger family, composed by other fellow human beings. This entry was posted in Parenting and tagged cleaning up earth, environment, kids go green. Bookmark the permalink. 1 Response to Let’s Clean Up our Planet!